It’s always good to get the best bang for your buck. Therefore, If you’ve made the decision to invest in the Disney Dining Plan, you’ll probably want to do a bit of planning before you head out in order to ensure you are getting the best deal possible. You see, the Dining Plan can be an awesome thing or it can be a total ripoff. By knowing which restaurants and foods give you the best value, you can ensure your purchase of the plan is the former rather than the latter. Here are my top tips for maximizing the Dining Plan and ensuring your money was money well spent. When you’re on the Dining Plan you can order any entree on the menu. Since the price of the plan doesn’t change based on what you order, go ahead and pick those super expensive entrees you would never dare order otherwise. Also, make sure you order a drink and dessert to go with it! Many Disney restaurants will allow you to order packaged carrots, apple slices, or grapes in place of fries or other sides. If you don’t think you can eat your entire meal in one sitting, swap out one of your sides for a packaged food item to snack on later. Recently, Disney has given guests on the Dining Plan the option of ordering alcohol at no additional charge. Take advantage of this! Alcoholic beverages are expensive, and ordering them on the Dining Plan will quickly ensure you get your money’s worth. Considering the number of snacks included on the Dining Plan, you will probably find yourself with a few snack credits left over at the end of the trip. If this happens, don’t let those credits go to waste. Instead, use them to grab some packaged snacks from a gift shop for the trip home. Many food carts give Dining Plan users the option of ordering a bottle of water in exchange for a snack credit. This is not a good value because you can actually order a free cup of water from any counter-service location, meaning you can save your snack credits for a delicious food item instead. Using your table-service credits for character meals is almost always an excellent value. Not only do character meals tend to be more expensive when paying out of pocket, you’ll also get some character meet-and-greets out of the deal. This means you have some extra time in the parks because you can skip over the characters you met during your meal. While character meals are almost always a good value, you do have to watch out for the meals that require two credits. Cinderella’s Royal Table is one of these, as are several other signature dining experiences. Two-credit meals are not a good value on the Dining Plan, meaning you should definitely skip over them or pay out of pocket. A select few counter-service restaurants offer self-serve drink refill stations. By seeking out these eateries, you can maximize your meal credit by having a soda with your meal and grabbing a free refill on the way out. You will receive a refillable mug at the beginning of your trip. This mug can be filled as many times as you like at your hotel’s refill station. Take advantage of this by grabbing a fill-up on your way to the parks, and again when you return to your resort. Little ones under the age of three will not have their own food credits. You may buy them food with money out of your pocket, but most people find it better to simply share with their tiny travelers. This is especially true when you go to all-you-can-eat buffets, as you will not be charged for children under three, meaning they can eat whatever they like. Because breakfast foods tend to be less expensive than lunch or dinner, using a meal credit for the first meal of the day isn’t the best option. Therefore, many choose to use a snack credit to order a light meal and save their meal credits for lunch and dinner. Pizza from the hotel food court is actually a great value for groups of 3 or more. A single pizza requires two credits, but it’ll easily feed 4–6 people without a problem. Therefore, if you find yourself needing to stretch your credits, this might be a good option. By using these tips and doing some clever planning, the Disney Dining Plan can be an excellent value for your family. Now, let’s stop talking about food and go out and enjoy some delicious Disney dining! Hey! What is that awesome looking drink and where did you find it? It looks like fun. Thanks for sharing. 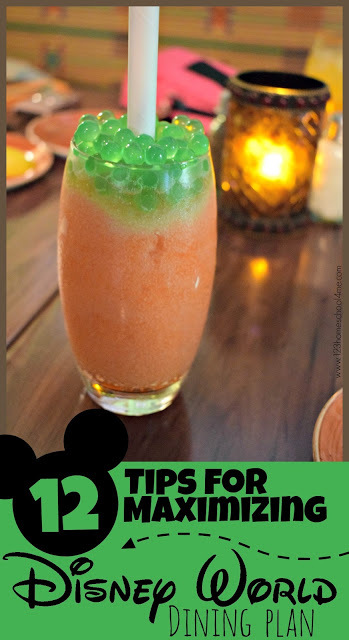 It is from the Skipper Cantena Recipe in Magic Kingdon – Frontierland by the Jungle Cruise ride.